Fair Trade USA has dramatically expanded the reach and aggregate impact of Fair Trade by aligning certification requirements more closely with conventional market logic and conventional sourcing practices. In the process, it has reduced the average impact of Fair Trade at the individual level. This is the mainstreaming paradox, and a source of discontent among FTUSA’s critics, who see the certifier doubling down on the mainstreaming approach with FT4All and further flattening the impact curve. With this graphic, based on Fair Trade impact research and our own experience in the field, I am trying to illustrate four points. Relatively few companies involved in Fair Trade deliver on its full developmental promise. The Fair Trade roasters leading the charge against FT4All take a transformational approach to trade and deliver deep developmental impacts for their trading partners. But there aren’t many of them, and they source a limited volume of coffee. The more market-based the orientation of Fair Trade Certification, the more diluted its average impact. The more Fair Trade Certification accommodates conventional market logic and supply chain practices, the less radically it requires its licensees to transform their trading practices to benefit poor farmers. Regardless of how certification is positioned in the marketplace, what farmers get out of Fair Trade depends on what roasters put into it. Fair Trade roasters fully committed to direct trading, pre-harvest finance, capacity-building, transparent price discovery and other core Fair Trade principles will deliver more benefits to their trading partners than roasters less committed to these practices. The four blocks here can be seen as four discrete business models, each one generating a different level of impact based on the particulars of its model. Some Fair Trade is better than none at all. For smallholder farmers who are not currently in the Fair Trade market, even non-transformational, market-based Fair Trade can deliver important gains over conventional trade: eliminating intermediaries in the supply chain, strengthening relationships with remaining supply chain actors and shifting more of the end value of coffee to the farmer who grew it. The concerns many of us have with Fairtrade USA stem from their violation of the open and transparent approach to fair trade that the movement and sales have been built on. They acted unilaterally and in doing so took the movement’s intellectual property and used it as if it was their own. Even changing their name to Fair Trade USA instead of the international nomenclature of Fairtrade USA. Fairtrade USA’s actions seem to indicate that the ends of increased volume justify the means of acting against the wishes of many of the stakeholders that dedicated years of activism, farming and education to build the fair trade movement. While this may bring decreased benefits to increased numbers of poor farmers and workers, acting in a secretive and unilateral manner goes against the very fabric of fair trade. Building a new empire on the backs of so many former colleagues casts a dark shadow on us all. I recently stumbled upon your blog and am very excited about the work you are producing. Thank you for your clear and well thought out presentation of ideas. I am currently writing a blog about the coffee industry in Fort Worth, Texas. I would appreciate it if you checked it out. I have seen a lot of transformational impact in smallholder and farm workers’ communities/families part of supply chains participating in Fair Trade and selling Fair Trade products to companies that would not fit into this “mission-driven” definition you use. Workers acquiring homes, communities significantly improving access to healthcare and education, and many other initiatives that created real improvement in smallholders (and workers) livelihoods and changes that fosters genuine empowerment. I appreciate the attempt to graph this issue but I think the graph unfortunately underestimates that impact that it is real in the lives of those smallholders (and workers) that participate in Fair Trade outside of the roasters on the left of this graph and have been able to significantly improve their livelihoods and their communities. Thank you again for the discussion, Michael. Thanks for your comment. I might have called more attention to the fact that the “impact” variable here is comprised of three dimensions, of which only on is livelihood impact at origin. I believe it is along this dimension that the difference in impact is narrowest across the different business models in the Fair Trade system. In other words, I believe everyone in the Fair Trade system makes meaningful contributions to improve smallholder farmer livelihoods. And the graph actually shows this — positive impact across-the-board regardless of trading model. Along the impact dimension of chain governance, by contrast, I think the gap in impact between the two ends of the trading spectrum is greater. There is another important point here that is not fleshed out in the graph — most successful Fair Trade coffee coops I know sell their coffee to actors all along the spectrum, from the worker-owned direct-trading Fair Trade roaster coop to the large-volume corporations whose commitment to Fair Trade sourcing is a small part of their trading models. As I have indicated here, I believe cooperatives need this diversity in the current marketplace to drive impact in the communities where their members live. Michael, I’ve been a “read-only” participant in this discourse so far, and I’m very grateful for your work, your analysis, and your thoughtful approach to the discussion. I think a lot about framing of ideas & issues, and, in your graphic of Volume/Impact analysis above, I question if the framework of “Mission-based” on one side and “Market-based” on the other may not be misleading, since all Fair Trade roasters, large and small, are using the market and market dynamics to accomplish their goals. De facto, everybody wants/needs to sell product. I know this framing isn’t original to you, and I understand what you’re trying to demonstrate with the graphic. For the sake of the larger vision of Fair Trade, I would wish for less “either-or” framing and more “both-and” in the discussion. Thanks for moving from “read-only” into the comment stream, and for your kind words about the blog. I think I can concede up front that “mission-driven” and “market-based” are probably inartful terms that obscure lots of important nuance and diversity along the Fair Trade spectrum. 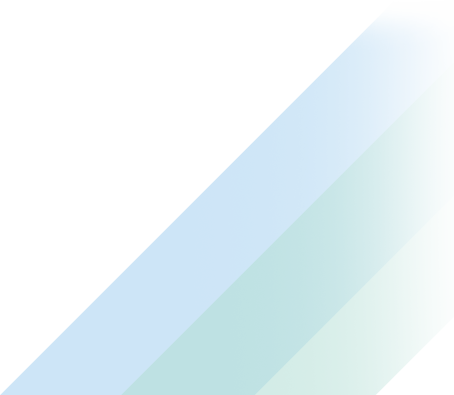 And if they are used in a binary way — i.e., all actors are either mission-driven or market-based — then it probably obscures more than it illuminates. These terms may also contribute to the suggestion that “mission-driven” is not also market-based, as you suggest. Of course, the power of Fair Trade is that it is a sustainable, market-based approach to poverty alleviation and community development in the coffeelands that is profitable for actors all along the chain. The “mission-driven” folks need to turn a profit as much as those in the market-based category, and the growth of the mission-driven category suggests they have. I settled on the language (reluctantly) after recently seeing it used in a mainstream academic context that seemed to me to validate the framing. Notwithstanding your objections to the language employed here, I still wonder whether the concepts behind the problematic language remain helpful in framing the diversity along the FT spectrum — a worker-owned cooperative that sources coffee directly and buys everything in its inventory according to Fair Trade principles is certainly a long way from a major food and beverage conglomerate sourcing less than 3 percent of its coffee through Fair Trade Certified channels, and there is plenty of diversity in between. I also think it is important to acknowledge at this moment in Fair Trade’s history that whatever you call them, there are different approaches to Fair Trade. And that the differences in the approaches have not only been the source of friction in the marketplace, but also are perceived differently at origin. Finally, as I hope I have made clear in my comment to this post, I fully agree that the diversity of business models in the Fair Trade fold is very much an “and-both” proposition, creating different channels to market with slightly different benefit streams, but all contributing to Fair Trade’s movement toward more just and sustainable commerce as a way to improve the lives of poor farmers. (1.) The diversification of the Fair Trade marketplace has not been a zero-sum affair. Since Fair Trade coffee first found its way into the U.S. market nearly 30 years ago, the movement has effectively incorporated new approaches to Fair Trade that have embraced Fair Trade in whole or in part. Notwithstanding some tension between different currents of Fair Trade, the movement has managed this diversity with notable success. So far, the entrance of new actors and new models has not precluded the growth of the original Fair Trade model. By almost any conventional measure — annual revenues, coffee volume, number of employees, expansion into new lines of business, etc. — roasters fully committed to the original concept of Fair Trade seem to have sustained growth even as new models have emerged. In fact, the number of roasters sourcing only Fair Trade coffee has increased over time, suggesting that the growth of new Fair Trade business models is not incompatible with the continued growth of older ones. (2.) The diversity of business models in the Fair Trade marketplace has created more opportunities for smallholder farmer cooperatives. Because many different Fair Trade models have experienced growth over time, there are now more commercial opportunities for smallholder cooperatives. Today, coops have more opportunities sell to “mission-driven” roasters; they also have other valuable opportunities to bring their coffee to market through trading models that may be less radically committed to Fair Trade principles, but still deliver important benefits to their trading partners at origin. It is my sense that in the absence of the less-radical Fair Trade models referred to here as “market-based,” the total volume of Fair Trade coffee in the U.S. market would be much lower than it is today. In other words, “market-based” Fair Trade coffee has not replaced “mission-driven” Fair Trade coffee — it has expanded the reach of Fair Trade coffee and created opportunities that wouldn’t have existed in its absence. (3.) The mission-driven current of Fair Trade faces a persistent macro-economic challenge. A Fair Trade pioneer recently acknowledged to me — even as he railed against FT4All — that the mission-driven current of the movement “doesn’t have a macroeconomic strategy.” As the graphic suggests, the mission-driven Fair Trade roasters who may deliver the deepest developmental benefits to their trading partners do not represent a stand-alone response to smallholder farmers seeking alternative trading relationships. Against this backdrop, smallholder farmers seek other opportunities that also contribute to the development of their families and communities — opportunities that “market-based” Fair Trade roasters create. I going to mix up here a bit. I’m going to agree with Miguel & David, at least somewhat, and disagree with you – sort of. The short version is that I think you’re being too pessimistic about human nature. Correct me if I’m wrong but I hear you suggesting that it is a sort of natural-fact-of-the-marketplace that the bigger the enterprise, the less they’ll practice a complete version of Fair Trade. Yes, they’ll buy Fair Trade crops in volume, but in a minimal, check-the-boxes manner that delivers less, maybe much less impact. In contrast, I, like Miguel & David, want to believe in the potential for profound decency by the decision-makers in ALL companies, small and large. For example, medium & large-sized corporations could indeed choose to practice Fair Trade as thoroughly as “mission-based” enterprises. They certainly have the resources and increasingly people (even lawyers and accountants!) are realizing that the supposed, and infamous, “fiduciary duty” to maximize short-term profits, or the share price, has been greatly exaggerated. So there’s the legal and managerial room-to-maneuver for any corporation who wants to get serious about this. They just have to have the will. And we have some real-world examples, too. Wholesome Sweeteners* is no worker co-op and were not founded as a Fair Trade enterprise either. And today they are, I think, the #1 brand of organic sugar in the U.S. And yet they seem to be very serious Fair Traders, too. With no outside prodding they’ve converted their entire product line to Fair Trade AND they’re seriously committed to supporting small-farmer co-ops. And there are the well-known examples from Vermont – Green Mt. and Ben & Jerry’s. With the success of their k-cups GMCR could have easily allowed their FT imports to plateau at, say, 2 million pounds a year, but they didn’t. Nor were they pressured to do this (as Starbucks had been earlier). And yet they’re a multi-billion dollar, publicly traded corporation. In fact, Equal Exchange, and maybe the whole Fair Trade movement, has always been predicated on the just this kind of “both-and” scenario (to paraphrase David). Speaking as a ‘mission-based’ Fair Trader we have been motivated by the possibility that people can change, and surprise you – even themselves. The cost-cutting Fortune 500 COO might see the beauty of Fair Trade and farmer co-ops, and take on the extra work, and complexity, and low-margins of trading directly with co-ops, and ensuring affordable credit, etc. I think Green Mt’s Rick Peyser and Ed Canty are great examples of these kind of internal change-agents. And just look at the historic arc of the coffee industry. 25 years ago most traders and roasters didn’t care about what happened at origin. They didn’t think you could work directly w/co-ops. They dismissed Fair Trade’s viability, etc etc. But many, many people have come around – through out the industry – and mostly they’re sincere in their support for Fair Trade and related practices. So we have the theoretical room to act, and many real-world examples. In which case why the presumption that there is or, worse, must be, a “mainstreaming paradox”? But we may never know who had a better read of human nature and what might have been. FTUSA has, we believe, repeatedly set a precedent of ‘lowering the bar’ to lure new, large licensees. We would like to think that they would have signed on anyway without such accommodations and that there’d be no “mainstreaming paradox”. For ex, back in the day, we & other Fair Traders had pushed for, and even expected, a requirement that a brand could only use the seal if they converted at least 5% of their volume, and they could only _keep_ the seal by steadily increasing that % every year. But that was just one of the requirements, or expectations, that got eased or dropped altogether. The result is the reality of today that you describe. The big buyers have, and mostly take, the option of a larger-volume/ lower-impact form of Fair Trade. But it didn’t have to be that way. And yet – with today’s schism – and with the re-entry of Fairtrade International into the US market we’ll have the chance to watch, and participate in, a very exciting ‘experiment’. We have two certifiers, with differing approaches, and we’ll be able to see if one is willing to set the bar substantially higher (where we thought it should have been all along), and if indeed businesses small and large will respond positively to that challenge. Thanks, as always, for your contribution to the discussion. I must say I think it ironic that you find me to be “too pessimistic about human nature!” I work for an agency guided by the profoundly counter-cultural vision that “solidarity will transform the world” – a vision that bets long on the fundamental goodness of human beings, even as we work in contexts marked by persistent violence, poverty and hunger. In my experience, the most successful development professionals are possessed of a highly resilient brand of optimism. We try to bring that same spirit to our work in coffee, squaring our committed optimism with the opportunities and constraints that present themselves in the specific contexts where we work. 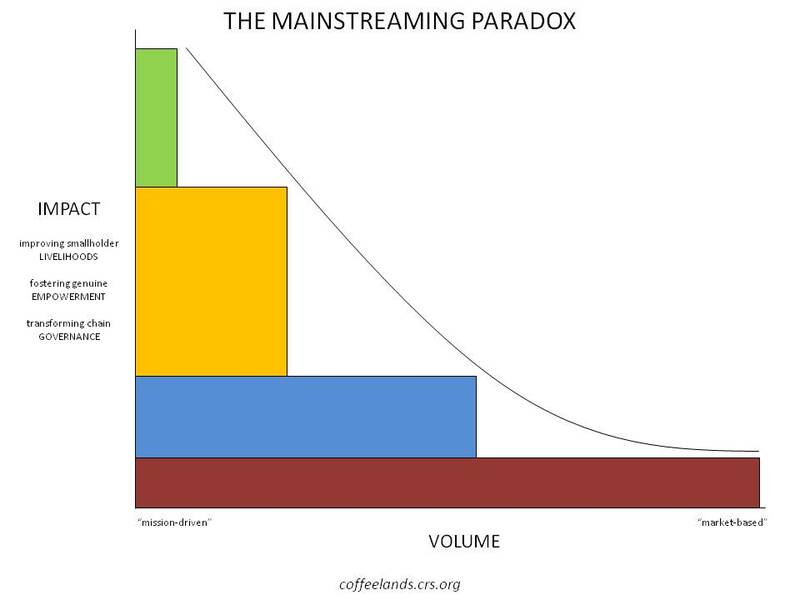 With regard to the “mainstreaming paradox,” I think you raise some very good points. On some of them, we can come to swift agreement. Where I struggle is with your reading of the thinking behind the graphic. Bigger does not equal less impact. Correct me if I am wrong, but I hear you suggesting that it is sort of natural-fact-of-the-marketplace that the bigger the enterprise, the less they’ll practice a complete version of Fair Trade. That is not at all what I am suggesting. Without question, the graphic was crudely drawn. The inclusion of the downward-sloping curve in particular does seem to suggest the relationship you read into the graphic – that more volume necessarily means less impact. But I don’t believe there is any necessary correlation between volume and the depth of a company’s commitment to Fair Trade. The degree to which a company commits to sourcing Fair Trade Certified products is fundamentally a function of the decisions its leaders make, not the volume of coffee they source. Expanding Fair Trade impact with growth. And innovation. I think that in Green Mountain you have brought up the single best example to show that bigger doesn’t necessarily mean less commitment to Fair Trade. The company became the world’s largest buyer of Fair Trade Certified coffee in 2010 precisely because its leaders are determined to maintain the company’s commitment to Fair Trade even as it experiences extraordinary growth. And I couldn’t agree more that Rick Peyser and Ed Canty are consummate “intrapreneurs” who have been instrumental in helping Green Mountain make and maintain its commitment to Fair Trade. But the growing volume of Fair Trade coffee is not the only source of Green Mountain’s positive impact on smallholder livelihoods. The company has also gone where few other roasters have – seeking new approaches to the issue of food security that improve upon the benefits Fair Trade delivers. I have raised these points on this blog here. And here. And here. What I meant to show with the graphic is that with the advent of certification, Fair Trade suddenly told you less about a company’s business model than it did before certification. And that Fair Trade coffee was suddenly “brought to you by” companies that did not seek to radically reengineer the coffee trade. In the beginning, Fair Trade as envisioned and realized by Equal Exchange was mostly an all-in affair. It was not about certifying a transaction, it was about an alternative approach to business designed to do right by the farmers selling coffee to Equal Exchange, but it was also about demonstrating for more conventional businesses a new and more equitable way forward. With the advent of certification, consumers couldn’t necessarily assume anything from the appearance of a Fair Trade logo on a coffee bag about a company’s business model or the depth of its commitment to transforming the coffee chain to benefit the smallholder farmers who represent its most vulnerable link. The impact of a company’s commitment to Fair Trade on issues of smallholder livelihoods, farmer empowerment and chain governance has less to do with the appearance of a Fair Trade logo on its product than with that company’s business model. How does it create value? How does it distribute the value it creates along the chain? Who decides? The colored blocks in the graphic are meant to represent different business models generating different benefit streams for the farmers who participate in them. Certainly, there are companies that do fit the stereotypes on each end of the spectrum – deep commitment to transformative trade over 100 percent of a relatively small volume of coffee on one end, and shallow commitment to certification over a small percentage of a large volume of coffee on the other. But I don’t see any linear or necessary inverse relationship between volume and impact. And examples you mention – Green Mountain, Wholesome Sweeteners, Ben & Jerry’s – are great examples of the diversity of business models that lie between these extremes. Experience and research, not presumption. Finally, at one point you suggest that I presume a mainstreaming paradox. The thinking behind the graphic is based less on presumption than our experience in the field with smallholder coffee farmers over the past 10 years and scientific research into the impacts of Fair Trade. Our accompaniment of smallholder farmer organizations has oriented us toward companies that deliver what cooperatives seek: high prices, long-term trading relationships, supply chain transparency and democracy, access to reinvestment capital, etc. We have found that companies that take their commitments to Fair Trade seriously, like Equal Exchange and Green Mountain, deliver mightily in these areas while other companies less committed to Fair Trade deliver these benefits perhaps less consistently. Importantly, peer-reviewed research into the impacts of Fair Trade seems to validate the general insight behind the graphic: relationships matter. As I explain here, the International Trade Centre’s authoritative literature review on Fair Trade impact studies shows that rigorous field research indicates that relationship-based Fair Trade can deliver deeper benefits than transaction-based approaches. I am gratified that the graphic has generated such a rich discussion here. I will spend some time thinking it over and try to refine its presentation to communicate more effectively some of the nuances that have surfaced in these exchanges. Michael, thanks once again for calm and thoughtful analysis and insights. We have been lacking this dialog in the world of fair trade. 1. Capitalism: all publicly traded companies in the US are legally mandated to maximize return to shareholders. How does that work with a commitment to farmer empowerment and paying a fair price? 2. Power and control: Fair trade was built on the premise that empowerment is a fundamental part of the model. The first certifications changed that. They were based on solidarity AND has no farmer/producer seats at decision making tables. FLO has slowly changed this. Fairtrade USA has unilaterally decided that by removing any farmer/producer control, they can move faster and create more impact. This is a radical shift. Paul Rice stated to me last year, I would rather sell 10 million pounds of bananas with a $.50/lb premium than 1 million pounds with a $1.00/premium. This is a critical point to debate and explore. 3. Markets: FTUSA wants to use existing markets to propel fair trade forward. Many of the smaller life as fair trade companies want to transform markets. How do we hold these two theories of change? Can they both continue to be called fair trade? Who “owns” the intellectual capital of fair trade? 4. Integrity: Again, who owns the intellectual capital of fair trade? Of FLO? Who can “use” the certification and standards of FLO? Who pays? 5. Big picture: how do we talk about macroeconomics? What’s a whole fair trade economy look like? How do the different visions fit under an umbrella? Or not. 6. How and What: For some, how standards are created and changed is important as what they are. For others, volume is more important than how changes are made. How might these two worlds fit together. 7. Organics: How can we learn from past movements? Organic (see Sunday’s NY Times article)? United Farm Workers? Civil Rights Movement? Fair trade in other countries with a longer history of fair trade? Again, I greatly appreciate the dialog created here. Let’s go deeper! This time I’ll keep it brief. Michael, I’m relieved, but not actually surprised, to be reassured of your radical optimism regarding human nature. And you back up that claim most convincingly. I guess it was just the strong, mostly unconscious, and I see un-intended, message implied by the graph that there existed an inverse relation between scale and depth of impact. Indeed, just as there are large scale, high-impact firms, there are _many_ small, micro-roasters and such who represent low scale, low impact & low commitment all at once. And then – more in line with the ‘paradox’ concept – we do have to be vigilant about cynical, usually large, Fair Trade licensees who with one hand arrange their Fair Trade imports, and then with the other engage in various practices that directly or indirectly undercut the same small farmers. Just FYI – Lynn Stout, a Cornell Law Professor, is one of many trying to challenge the widely-held perception that publicly traded corporations must either maximize profits &/or share holder value. If she’s correct, than corporations have one less justification for exploiting small farmers (not to mention a host of other un-just, unsustainable practices). Yes, there is a paradox. AND, I am concerned that we assume the paradox means that to mainstream, a certifier has to choose a strategy of unilateral decision making and going against the wishes of the very farmers’ organizations certified to date and the international movement. Fair Trade Foundation in the UK has been more successful than any efforts in the US and they have a multi-stakeholder approach with much greater transparency. It is a different country….yes, we have many challenging conversations to have about the paradox. I hope we don’t assume the only way to mainstream is the way FTUSA has chosen. I have great respect for the hard work and great accomplishments of FT USA. And, I strongly question the way they have gone about mainstreaming. The lack of any meaningful dialog between them and many other parts of the movement is disappointing.